The warm consonants of his name and my daughter Natasha Richardson's excited reaction when I told her that Philip Seymour Hoffman was cast to play Jamie Tyrone to my Mary Tyrone in Long Day's Journey into Night stoked my imagination. I didn't know his work when we first sat down to read the play, and I didn't know the man when the Tyrone family took its last bow on Broadway in August 2003. But I saw this conjuror bring Jamie Tyrone out of the obscurity that embeds the greatest of scripts. No, I didn't see the conjuror. That's the whole point. I never saw the conjuror. Jamie Tyrone appeared. When? I don't know. The desperate, accusing eyes of the drunk looked hard into the eyes of his mother the morphine addict. A thousand horrible and tender memories pierced through the addictions, demanding appeasement at all costs. All this long before costume, hair and makeup. Harold Pinter writes of the great Irish actor Anew McMaster's King Lear and Othello. You see the old man in his 60s; you see and hear the actor's greatness. I can convey only a faint impression of Hoffman. If he had maintained his tousled hair and rehearsal trousers, he would still have been Jamie. Seven times a week, Hoffman propelled himself with one deep groan into the darkness of the stage, and as Pinter says of McMaster, "He got there." 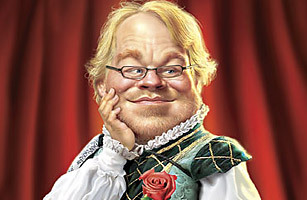 And he has stayed there; Hoffman, 38, won the Best Actor Oscar this year for his portrayal of Truman Capote. I hope I get to see him play King Lear when he's 50.